Garvoc is a rural village in western Victoria, between Terang and Warrnambool. Situated on the Princes Highway and the South Western railway line (1890), it is 12 km south-west of Terang. Garvoc was named after Mount Garvock, which was named by the New South Wales Surveyor General, Thomas Mitchell, when returning from his Australia Felix expedition in 1836. Mount Garvock (216 metres) is west of Garvoc and is now known as Mount Warrnambool. The Garvoc area was occupied by the Yallock pastoral run, and it is near the junction of the Yaloak and Mount Emu Creeks. The Yaloak swamp is just north of the village. The well watered area was later developed for dairying, although a considerable amount of tree cover was cut down. The Catholic school continued until 1929, when an enlarged State school was able to accommodate some or all of the pupils. In 1935 the butter and cheese factory entered into an agreement with Kraft for the supply of milk. Notwithstanding the closure of the Catholic school, the Catholic community constructed a large replacement church in 1954. It is among the few large public buildings in Garvoc. The triple fronted Yallock Inn (1904) is another prominent building. The butter factory was closed in the mid-1960s, but dairying has continued as a main industry along with other grazing. The almost complete clearing of timber lead to severe grass fires on Ash Wednesday in 1983, causing the loss of the school and the Presbyterian church. Both were replaced. 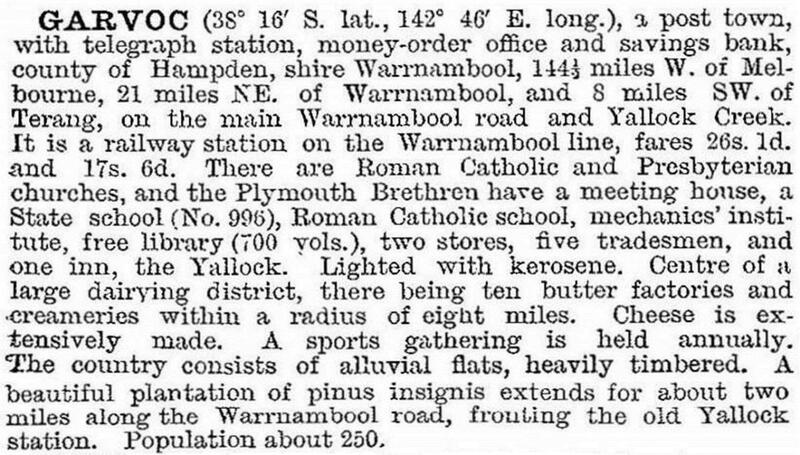 Garvoc has a hotel, a Catholic church, a public hall, a recreation reserve (1902) and a post office/general store. The school closed in 1993. At the 2011 census dairy farming accounted for 35.7% of employment and other farming 8.4%.